Below you will find a list of all the Lucky31 Casino bonuses - offered to new players. 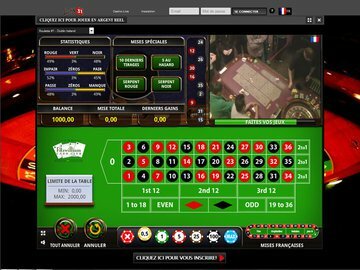 The right side offers a casino overview (click to scroll through the images). Lucky31 casino launched in 2014 and is owned by StarFish Media N.V. They use a number of top brand software providers to bring their players the best games the gambling world has to offer. This includes software from NetEnt, Microgaming, Leander Games and more. The site features a live casino as well as slots, blackjack, table games and progressives. It is only available in a no download instant play option. There is also mobile casino option so you can enjoy everything on the go with your iPhone, iPad or Android smartphone and tablet. Lucky 31 Casino launched in 2014 and their main target was the UK and French market. Recent changes in the the UK gaming taxes have however caused them to focus their efforts more towards France. Their main attraction is the Live Casino which is hosted live at Fitzgerald Casnio in Dublin, Ireland. While the casino accepts players from Canada, you must play in EUR which isn't the most attractive option. This is probably the main reason why this brand has very few Canadian players. Most of the Canadian players registered with this site come from the Ontario and Quebec according to the brand manager who consented to an interview in order to compile this review. The Lucky 31 bonus for new players is a 131% bonus up to 100 Euros when you make your first deposit and you don't need a bonus code to redeem this offer. Unfortunately they don't have a no deposit offer to attract even more players with. The welcome offer is a little low compared with other sites but they have plenty of other offers that might just help to make up for this. There are regular reload bonuses for all players and the Superpoints program is better than most rewards programs you will find. Players receive 200 Superpoints just for signing up for an account and there are more rewards for other actions that you take such as logging into your account, making a deposit, playing your favorite games and more. Be sure to take advantage of the Happy Hour program where you can double your Superpoints. You can find out exactly how many points you get for your actions on the website. Don't forget to check out the shop to see what you can redeem your points for too. You can redeem them for free spins or for as much as â‚¬500 in cash. A cashback program is also in operation at Lucky31 and all players get a little extra reward when luck is not on their side. If free spins are what you are after you won't be disappointed. Lucky31 has over 500 games and they love giving free spins to players so they can test out the new games risk free. Full details including the terms and conditions for all these promos are available on the promotions page on the website so be sure to check them out if you are considering signing up for an account. 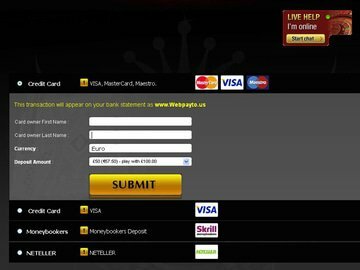 Lucky 31 casino uses a number of different software providers including NetEnt, Microgaming and Betsoft. This means that players get to enjoy over 500 of the very best games. Microgaming has been rated the top software provider for many years and produces some of the most popular titles like, Mega Moolah and The Dark Knight, and boasts the largest progressive jackpot network. NetEnt and Betsoft are best known for their amazing video slots including 3D slots. This gambling site has over 7 progressive jackpots up for grabs as well as the best slots, blackjack, video poker, roulette, Live dealer and table games. All the games offered are available in flash mode which means there is no download required. A free play mode is also available for those who wish to try out the games before playing for real money. There is also a mobile casino available that is quick and easy to use. It is available for iOS and Android and it has over 100 fantastic mobile games with more being added all the time. The most attractive part of this site has to be the live dealer games. The games are broadcast live from the Fitzwilliam Casino and Card Club in Dublin, Ireland. You are brought right into the Club where you can play baccarat, blackjack and roulette with live dealers. All these games are brought to you by Visionary iGaming and Microgaming software. The casino itself is multi-lingual and is available in English, German, Dutch, Finnish, French, Spanish and Portuguese. While the Lucky31 casino is open to players from Canada, they do not allow wagering in CAD. The currencies available at this site are GBP, USD and EUR. Managing your account is easy and there are lots of deposit and withdrawal methods available including Visa, MasterCard, Skrill, Neteller, PaysafeCard, and Ukash. Unfortunately Canadian players cannot make use of Instadebit as it is not available. Withdrawals using e-wallets take up to 24 hours and withdrawals using Visa or MasterCard can take up to 5 working days. Players are allowed to withdraw up to $1,000 per day and up to $5,000 per week. The maximum withdrawal amount per month is $20,000. Full details can be found on the banking section of the website. Support is available 24/7 and is available in English, German, Dutch, Finnish, French, Swedish and Portuguese. Customer support can be contacted via live chat, email and phone. There is also an extensive FAQs section on the website which is full of useful information. In our opinion, as far as Canadian online casinos go, this is a fairly good choice. They have various promotions and even though the Lucky 31 bonus is not a no deposit offer, it still gives new players an increase in their initial bankroll without the use of a bonus code. The site uses top software providers such as NetEnt and Microgaming and there are plenty of great games to choose from. Free spins are given on a regular basis and there is a mobile casino for those who like to play on the go. If you are looking for a new site to play at, this is worth taking a look at.